Amit Barak of Im Tirzu accuses Ayman Odeh, head of the United Arab List, of inciting Israeli citizens not to serve in the IDF. Amit Barak, one of the founders of the Im Tirzu organization and an activist advocating IDF service for Christian Arabs, is demanding that Attorney General Yehuda Weinstein open an investigation against Ayman Odeh, head of the United Arab List, for violating laws against inciting Israeli citizens not to serve in the IDF. While Muslim Arabs are exempt from IDF or national service, Christian Arabs are generally required to serve in the National Service, assigned to help in hospitals, schools, and other institutions where manpower is needed. Odeh is opposed to National Service, said Barak, and in 2013, he spoke at numerous schools in Nazareth, where many of the residents are Christians, encouraging listeners not to serve in the IDF or do National Service. On November 9, 2013, Barak wrote in his complaint, Odeh termed IDF soldiers “disgusting,” and said that they had no right to vote in a local Nazareth mayoral election. For a solid week, Barak wrote, Odeh incited against military service, speaking in almost every high school and junior-high class in the city. Odeh has admitted to these activities in numerous interviews, and did not deny any of it when he was asked about the matter by Barak, the activist said. As a result, Barak is demanding that Weinstein prosecute Odeh for violating laws against this type of incitement. 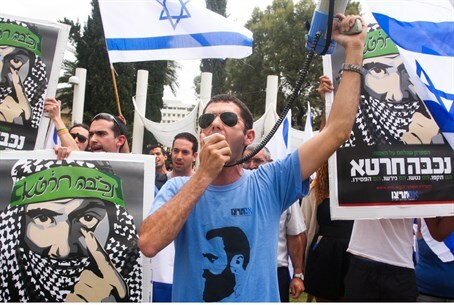 According to the law, anyone who tries to incite or use force to prevent Israelis from serving in the IDF or National Service can be sentenced to up to five years in prison, with other related charges having penalties of up to 15 years in prison.